When you add software to Windows, you need to have an easy way to run that software. If you are just adding a few graphical tools, you would save them to the desktop and click on the resulting icon. But when you add command-line tools, you would prefer to have them hidden in some directory filled with tools and simply type their name. You could place them with the standard operating system components, but that quickly becomes hard to maintain. A better solution is to create a new directory and modify the user's PATH. 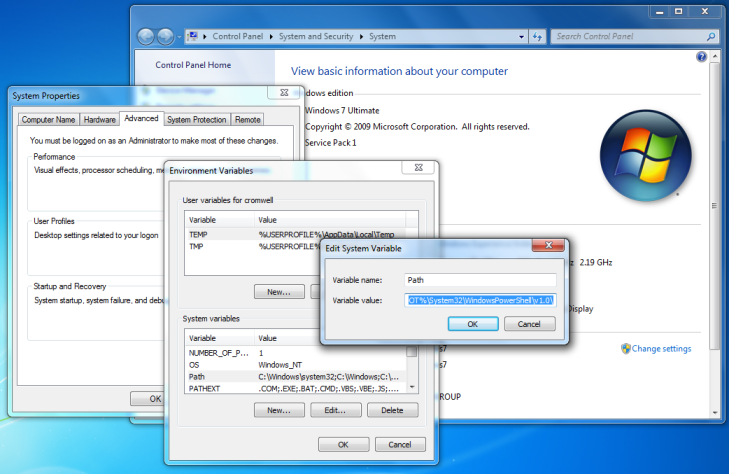 Commonly-used operating systems use a PATH environment variable. Linux and other forms of Unix, macOS, and Windows all use a PATH associated with the user's environment. When you attempt to run some executable program by referencing its name, the command interpreter searches through the directories in the PATH looking for an executable program by that name. Or, in the odd case of Windows, with that name plus a period and some extension, e.g., .exe. The first match wins — the first such program found is run, regardless of whether there happened to be any other executable programs by that name in later PATH directories. Windows does not come with useful secure networking utilities like SSH. So, you will need to add PuTTY or a commercial alternative. So let's say you have pulled down pscp.exe, psftp.exe, and putty.exe from the PuTTY download page and installed them in the new directory c:\bin. Our problem is therefore adding c:\bin to the PATH environment variable. This is where things get a little strange. The PATH variable is an aspect of the user's environment. It is set when the user authenticates to the operating system and a session is established. It can be modified within that session, but it is a part of the session environment and it is discarded at the end of that session. Your first task is finding where this is set. It depends on your version of Windows. Right-click on My Computer and select Properties. Make certain that you are right-clicking on the My Computer item itself and not some "shortcut" lurking on your desktop. Correct: New window is titled "System Properties" and has seven tabs in two rows as seen below (Windows XP/200*) or five tabs (Windows 7). Wrong: New window is titled "My Computer Properties" and has two tabs. Click on the start button, right-click on Computer and select Properties. Another new window will appear. Click Advanced system settings in the new window. At this point you should have a window named System Properties. Click on its Advanced tab. 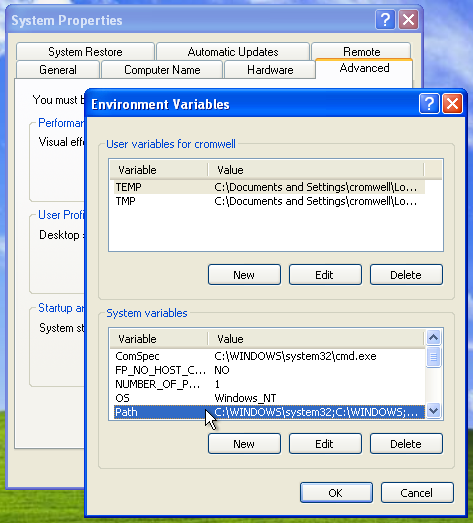 On the Advanced panel, click on the Environment Variables button. A new window will appear, as shown here. Now that you are looking at the list of system environment variables, find the Path value in the list. You may have to scroll down to find it. Click on the Path value to highlight it as shown here, and then click the Edit button. A new window will appear with the current value highlighted. Do not remove or change the current value, or you will wreck your user settings! You want to add ;\bin to the end of that list, so it becomes something like this. However, do not change the entire string to this example! Leave the existing PATH assignment as you find it and simply add your new directories. At this point, you do not need to reboot. Really! This is pretty amazing, a Windows configuration change that does not require at least one reboot! Any existing command prompts will, of course, still have their original PATH. But newly started one will get the updated PATH. It would be a good idea to immediately start a new one and test your changes. You will notice that "." is not a member of PATH. However, if you happen to be in the same directory as an excutable you can run it simply by typing its name. How does that work? In Windows, "." is always a component of your PATH and there is nothing you can do about it. That's right — in operating systems it is considered best practice for security to leave "." out of the command search path, especially for privileged users, and especially for the system administrator. Windows behaves the opposite way. But that's a security concern, and the design of the Windows operating system ignores many well known security issues. Jim Allchin was a vice-president and later, a co-president, of Microsoft. Allchin was co-president of Microsoft's Platforms & Services Division, he was the manager of the Vista project, and led the development of a number of Microsoft's operating systems. Jim Allchin was Microsoft's guy in charge of operating system design. He has provided some interesting insights, as in the following memo he sent to Bill Gates and Steve Ballmer, referenced here, here, here, and here.